How can you add Minimum Order Quantity and Units of Measurement? The Minimum Order Quantity (MOQ) requirement specifies the lowest quantity of a certain product that a supplier is willing to sell. The Units of Measurement (UOM) requirement specifies the granularity of products and is used when products are purchased in boxes. Note that UOM will be a number entered, not text such as 'case' or 'pallet'. When MOQ and/or UOM is specified it does not change replenishment numbers for products. However when such product is added to a purchase order and the quantity is below the MOQ or outside of the UOM, it's automatically rounded up to the MOQ or UOM number as appropriate. When a MOQ is specified it does not change replenishment numbers for products. However when such product is added to a purchase order and the quantity is below the MOQ it's automatically rounded up to the MOQ number. The Units of Measurement (UOM) requirement specifies the granularity of products and is used when products are purchased in boxes. 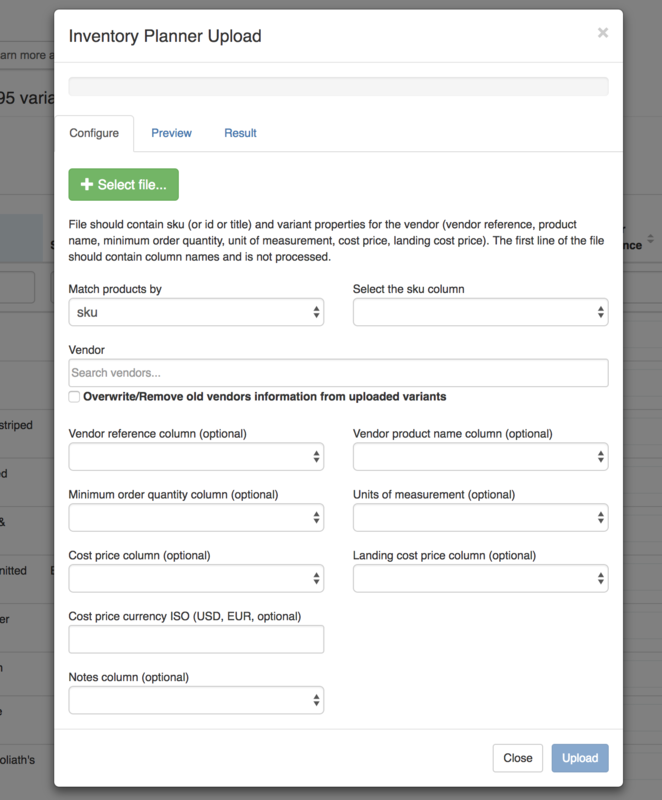 It's also can be set manually on Vendors -> Vendor Name -> Variants page or uploaded as the part of a vendor catalog. When a product with MOQ is added to a purchase order quantities are automatically converted up to the next MOQ number. E.g. when a MOQ is set to 5 and the replenishment number is 7 it will be converted to 10 (2 packs of 5 items each).